Safe riding requires knowledge and skiIl. To earn your license, you must pass both a knowledge test and an on-cycle skill test. These tests will cover the information, practices, and ideas from this manual. To pass, you will have to study this manual thoroughly and practice the skills and techniques it discusses. Here are some study questions. They are the same kind of questions you will find on the knowledge test. See if you can complete them correctly. Answers are printed at the bottom of the next page. A. they are following too closely. B. you will be slowing suddenly. C. there is a stop sign ahead. The FRONT brake supplies how much of a cycle’s total stopping power? A. about one-quarter. B. about one-half. C. about three-quarters. A. make eye contact with the driver. B. get ready to give way. C. hold position in lane. A. shifting your weight quickly. B. turning the handlebars quickly. C. getting the cycle to lean quickly. A. hold the handlegrips firmly and stay off the brakes. B. shift your weight toward the good wheel and brake. C. normally brake on the good wheel and pull off the road as soon as possible. Get and keep yourself and your motorcycle in safe condition. Accelerate, brake, shift, and turn safely. Help others see you and help you see and communicate with them. Adjust speed and position to changes in traffic and riding conditions. Stop and turn quickly to cope with problems while riding. Selecting safe speeds while going straight and turning. Picking the correct path and staying there. Making normal and quick stops. Making normal and quick turns. 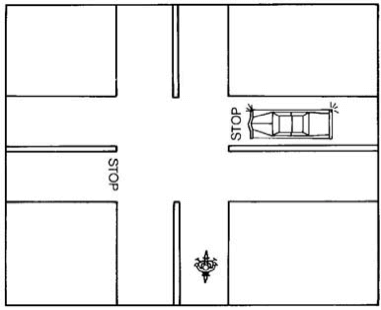 Distance—e.g., Did you stop within the space allowed? Time—e.g., Did you turn fast enough to handle the situation? Position—e.g., Did you keep the cycle in the proper path? Procedure—e.g., Did you use both brakes to stop? If the on-cycle test is taken on a trike or a motorcycle with a side car, your driver license will be restricted to 3-wheel only motorcycles.